Owners of a 1980 Leschi home wanted color, and something different. They got it. Yep; Brooke Davis and Jon Wagher are cat people (metaphorically!) whose snuggly purrball Sonia is, all three agree, both queen of the house and a key design element. But the two resident bipeds also are skiers and hikers and bicyclers. And travelers and party-throwers. And glamorous ballet-goers. And fans of fuchsia. So now, after a synergetic collaboration with the namesake of Michelle Dirkse Interior Design, their light-heavy Leschi home expresses everything they are. But not necessarily the “different” they encountered after falling instantly in love with their 1980 home’s floor-to-ceiling windows, ever-changing views and nature-in-the-city vibe. Still, love at first sight is a powerful force, and so there they were, all of a sudden moving from their 1949 Maple Leaf bungalow … and into their new basement for the six-month main-floor makeover. They discovered Dirkse, perhaps with a guiding click from fate, on the home-remodeling and design website Houzz. Dirkse started with two refined but modern solid black sofas that anchor the living room’s symmetrical layout and give guests (and Sonia) multiple places to perch. The pink stone is no more, but shades of rich fuchsia pop up in two Palmer ottomans, a pillow codesigned by Dirkse and a painting by local artist Noël Fountain near the built-in bar Wagher always wanted. 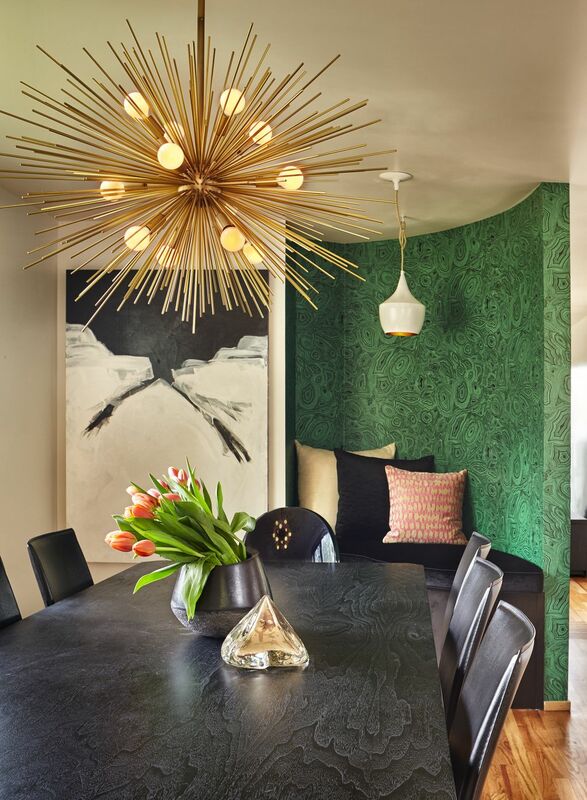 In the dining room, a substantial black table with angular subtle accents grounds a big, glamorous chandelier. 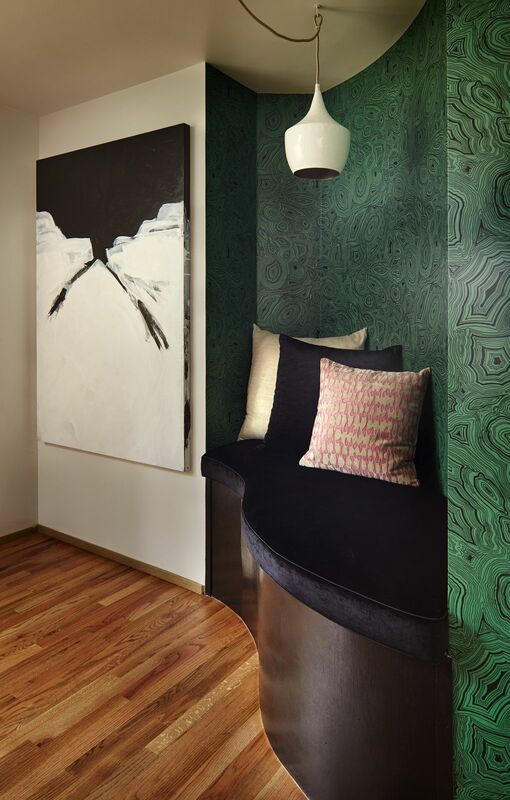 At one end, nature-invoking green malachite wallpaper curves around a bench nook. The quieter media room (AKA “cat space,” as that’s where the kitty pillows landed) serves as a cozy spot for cuddling and TV, with another powerful blast of fuchsia in the rug. In each room, Dirkse offered options and helped Davis and Wagher decide when to splurge and when to go lower-end. Some buy-big decisions were instant (the obsession-worthy living-room bench from Jonathan Adler), and some took a little longer. 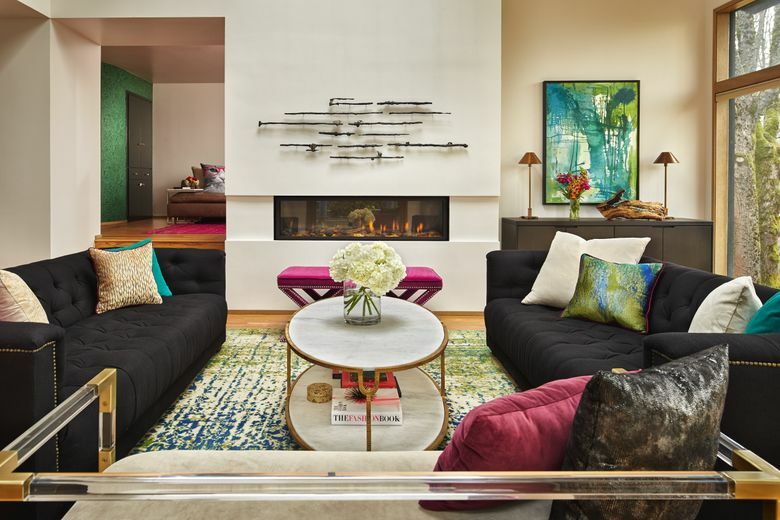 To tie the living room together, Dirkse suggested two substantial splurge pieces by local artists: a cast-iron sculpture by Mya Kerner above the fireplace, and a green textural painting, also by Fountain, above the buffet. Because they were such splurges, Dirkse initially borrowed them for a test hang. Once they saw the pieces in their space, Wagher says, their value was undeniable. Speaking of work (and artistry): More modernization awaits. Sandy Deneau Dunham writes about architecture and design for Pacific NW magazine. Benjamin Benschneider is a magazine staff photographer.